Formoid is a free desktop app that helps you easily create html5 contact form, html5 contact form, php contact form, jquery form plugin and more in a few seconds without writing a single line of code. 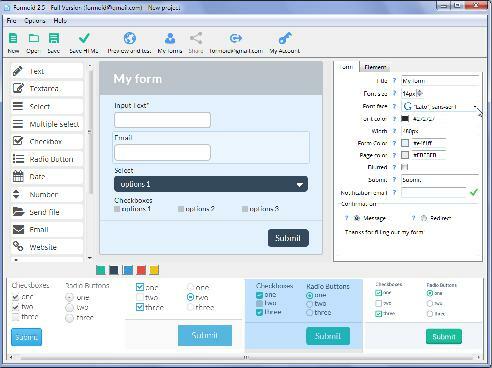 Create brilliant online forms in just a few clicks. How can I add html form select to the page? I have downloaded Formoid and i tried to integrate it into my website. But for some reason I'm not getting it to work. Can you help me? 1) Use "Preview and test" button. You form will be saved and processed on our server. Hi Love the product, just what I've been looking for, when server side processing abilities are added it should be amazing.